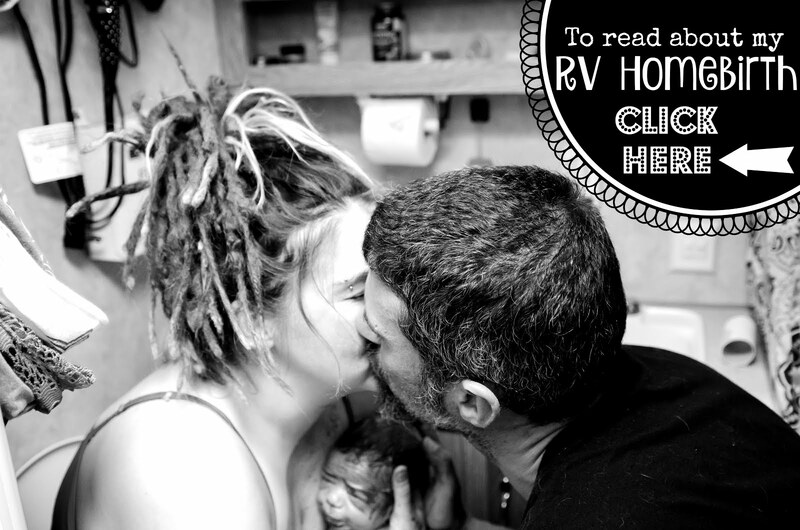 The Boho Hobos: RV Yoga and When's Daddy Coming Home?! The past few days have gone by quickly. We wrapped up our Oak Meadow curriculum homeschooling for First Grade and found out Ahdoo (Daddy) is coming home next Wednesday to buy a truck, hitch up, and take us and our home-on-wheels back to Virginia with him. We also played around with some RVing Yoga poses, had S'Mores (a first for Cinderella), and once again, enjoyed some beautiful scenery. It turns out that headstands are possible inside. Monster High Girl goofin' off in her Tree Pose. Gotta turn sideways for Wheel Pose. MHG working on her Wheel Pose...it's getting there! She definitely has one killer Warrior I Pose! Trying her hand (and foot) at Eagle Pose. Eagle is one of my favorite balance poses. What a pretty Dancing Shiva! Coming to the end of First Grade, she showed me that she's been slacking off in the drawing department until now! Look at that Monarch! After a long day of Yoga and Homeschooling, we decided to finally have a fire and make some S'Mores. Except that I am pretty sure that we have the only two children on the planet that do NOT like S'Mores...weirdos. After we (I) ate the S'Mores, we played with the neighborhood kids for a while. After about an hour of excitement, it was time for bed. Sunlight on the valley after it rained. Thursday morning, as I stepped outside to finally empty my black tank, I was treated to some gorgeous fog! I'm pretty sure diapers don't go on your head? The last day of Homeschooling. 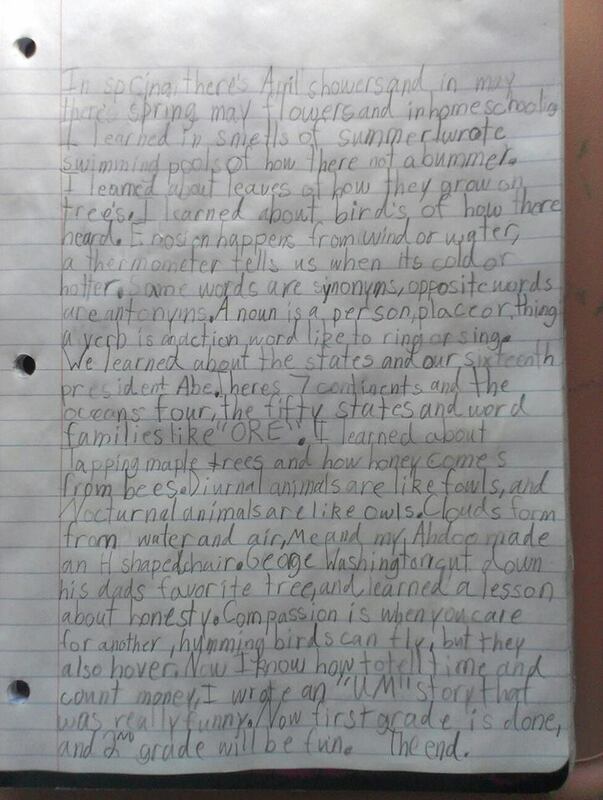 She wrote a poem about what she learned this past year. 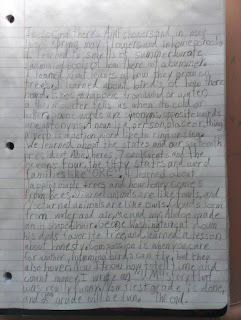 She remembered what she learned, I thought of the two rhyming words to describe it, and she applied them to sentences. I love it! I've been trying to do yoga in my current attic room so I too know it's possible. I hope you get to take the mat outside as much as you can. My son doesn't like s'mores either, only marshmallows. Cold ones. Kudos to you for CD'ing on the road! Also, it's so funny, I am wearing the same headband right now! We get to take our mats out outside a lot now! Much easier to do Yoga outside instead of in... Although, the cold is coming and me+cold Yoga=disaster... I guess my kids aren't the only ones on the planet that don't like S'Mores then! Good to know! :) I still CD on the road, I can't imagine NOT CDing! The only difficulty is just making sure that any of the RV parks we got to not only have laundry facilities on site, but that their facilities also have hot water (some don't). :( I love my headbands! Most of which are compliments of Wal-Mart! :) Thanks for commenting! If we're ever at the same campsite, I'd love to learn yoga! Just found your site, and I'm adding you to my fulltiming families list!